Sir Christopher Wren's original design for the Royal Hospital Chelsea was for it to house 412 veterans and their officers around Figure Court (now the centre quadrangle). Whilst the buildings were in construction it was realised that the space would be insufficient and Wren added two further quadrangles to his design - now called Light Horse Court and College Court. To learn more about the magnificent buildings, expand the options below. The Figure Court is the oldest part of the Royal Hospital Chelsea and was started by Wren in 1682. 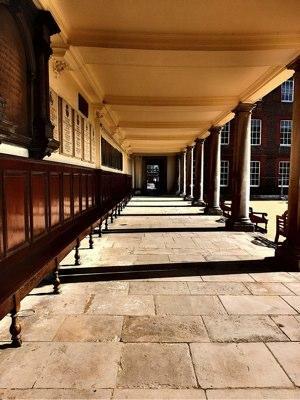 The colonnade is all Wren's original work, with the benches and panelling dating back to 1688 and the Latin inscription is said to have been composed by Wren himself. The Doric columns of the main portico, 32 feet high, support the Royal Hospital's water cistern which was originally filled from the River Thames. The 7'6" statue of Charles II, from which the Court takes its name, is the work of Grinling Gibbons. It shows the King as a Roman general, holding a baton as a sign of his Imperial authority. The statue was presented to the King by Tobias Rustat in 1682 and was moved to the Royal Hospital after the King died in 1685. Originally gilded, it was bronzed in 1782 but was re-gilded in 2002 for the Queen's Golden Jubilee. This quadrangle was added by Wren for James II in 1687-8. It was originally a plain gravelled yard, and the fine wrought-iron cage and lamp-post in the centre protected a well which was provided for watering horses. The current layout of the Court was created by Soane in 1819. The North-East wing accommodation provided quarters for a number of Officers. This was heavily damaged, with some loss of life, by enemy bombing during World War I. It was reconstructed in 1923 only to be destroyed again in World War II by a V2 rocket. After World War II, reconstruction was delayed but, in 1964-65 the ruins were replaced by a exact reproduction of the original exterior. The interior arrangements were, however, quite different, and the new building was occupied by additional Long Wards providing 64 additional rooms for Chelsea Pensioners. During the construction of the Margaret Thatcher Infirmary the building was used as a temporary Infirmary. It is now used as Long Wards and was the first area to be refurbished with the new en suite shower room facilities. Until the early 19th century, the Great Hall was the dining room for the residents at the Royal Hospital Chelsea. It was furnished with sixteen long tables (one for each Long Ward) which would provide space for two sergeants, two corporals, a drummer and twenty-one private soldiers (in all twenty six, the number that lodged in each Long Ward). Although the kitchen was placed by Wren adjacent to the Great Hall there was no connection until 1824. Prior to that all the food was conveyed along the Colonnade and through the main entrance. Heating was provided by an open fire in the middle of the Hall. Towards the end of the 18th century the Chelsea Pensioners took to dining in the Wards, and from the early 19th century all food was collected from the kitchen. The Great Hall was then used for recreation, court martials and Army entrance examinations. It was also in this room that the Duke of Wellington's body lay in state in 1852. The table on which his coffin rested is just inside the entrance to the Great Hall. Today it holds two 5 gallon 'black jacks', leather jugs formerly used for bringing ale up from the beer cellar below. In 1955 the Hall was restored to its original purpose, and oak benches have since been replaced by chairs. The large mural painting at the far end of the Hall dates from about 1690 and represents Charles II on horseback surrounded by allegorical figures, with the Royal Hospital buildings in the background. It was begun by Antonio Verrio but is mainly the work of Henry Cooke. It was restored in 2002. The portraits of George II and Queen Caroline, by Enoch Seeman (1739) and portraits of George III (1767) and Queen Charlotte (1762) by Allan Ramsay. The equestrian portrait of John, Duke of Marlborough (c. 1702) by John Closterman, which hangs in the gallery over the door, was presented by the Drapers' Company in 1954. The other 17th and 18th Century paintings are mainly copies of originals by Kneller. William II's coat of arms, carved by William Emmett, is on display above the entrance of the Great Hall. The Great Hall is also hired out for private functions. The four storey wings on the East and West side of Figure Court contain the Chelsea Pensioners living quarters, which are known as Long Wards. The original berths, as designed by Wren, measured six feet (1.8 metres) square. Gas lighting was installed in 1854, but it was not until the early 20th century when electricity was installed that there was any lighting in the berths. At present the East and West wings are symmetrically planned, with a pair of Long Wards arranged back-to-back on each side of the four floors. Each Long Ward is 200 feet (61 metres) long with a line of wainscoted berths running down the inner side, now containing 18 berths. The stairs at the northern ends were designed to be shallow and wide for the convenience of the older and infirm. The staircase in the East Wing is modern, having been damaged by bombing in 1940. The wood used to repair it was left over from the repair of the House of Commons, and the repaired wall is picked out in lighter brick. Wren provided separate stairs at the south end of each wing as a means of escape in case of fire. The berths were enlarged in 1954-55 and again in 1991 to 9 feet squared (2.7 metres squared). The Octagon supports the Royal Hospital Chelsea's distinctive cupola and lantern and rises to a height of 130 feet. Over the north entrance are the Royal Coat of Arms from the Royal Hospital at Kilmainham, Dublin, removed when it closed in 1925. The statue of a Chelsea Pensioner on the North Front, by Philip Jackson, was unveiled in 2000 to commemorate the Millenium. About the base is the soldiers' prayer, based on that said by Sir Jacob Astley before the Battle of Edgehill in 1642 - "O Lord you know how occupied I shall be this day. If I forget thee do not forget me". One of the most important rooms at the Royal Hospital Chelsea is the Council Chamber in the State Apartments. It is one and a half stories high and was designed as the dining room for visiting Royalty. The heavily moulded ceiling, displaying James II's cypher, is by John Grove, the wainscoting by William Cleere and the fine lime wood carving over the fireplace by William Emmett. The State Apartments also feature a painting of Charles I and his family by the school of Van Dyck, and portraits of Charles II, Queen Catherine, James Duke of York, the Earl of Ranelagh, Sir Stephen Fox and Sir Christopher Wren. The State Apartments can be hired for private functions.